Home of Champions | Twende pamoja! You might not have heard of Iten but you’ll likely recognise a few of the names that started their journeys to greatness training on its dusty red roads. Perhaps you read that the world record for the marathon was broken last month by Dennis Kimetto in Berlin. He did it in 2:02:57. 26 miles in just over two hours! He’s from Elodret, the next town over from Iten. The record holder before that was Wilson Kipsang, also from Iten. Then there’s David Rudisha who smashed the record for the 800m so spectacularly at the London Olympics in 2012. He’s Masai, so not a local, but he migrated to Iten to train under the legendary tutelage of Brother Colm at St Patrick’s High School, an Irish priest whose missionary work took the form of coaching athletics to the Kenyan youth – despite having had no formal training and never running a race in his life! Now I’m not an elite athlete (yeah, yeah I know, far from it) but a couple of years ago I was “converted” to running (ok probably more accurate to say jogging) after many years viewing it as a pointless and painful activity. Now I stand thoroughly corrected on that stance – painful but not pointless – and after spending my first six months out here training for a marathon (https://twendevso.wordpress.com/2014/07/02/kukimbia/), I wanted to try catch some of the Iten magic. Luckily my flatmate, Natalie, is also a runner and it didn’t take much to convince her a visit would be perfect preparation for the Nairobi marathon at the end of October. We checked into the rather literally named High Altitude Training Camp established by Lornah Kiplagat, a four times world record holder. The camp, despite being booked out by professional teams for many months of the year (the Brits were arriving the week after we left), also opens its doors to mere mortals hoping for some of the star dust to rub off on them. Even before we’d even hit the glorious running routes winding through surrounding countryside, we found plenty to entertain us in the other guests. There were only a few but they’d come from far and with serious training schedules: twice a day runs, afternoon swims and late gym sessions. Every. Day. There was the Finnish couple who came every year for a month. She was a professional marathon runner and the second Finnish woman to reach the summit of Everest. He was a triathlete who was just about to buy an altitude tent to sleep in back at home so he could get the physiological benefits of mild oxygen-deprivation all year round… There was the French running shoe designer who also competed in middle-distance races and a Singaporean chap who enlightened us that marathons started at 3am in his country to try avoid the humidity as much as possible. Then was a man with a mysterious accent who – after much google stalking – turned out to be an ex-pro long-distance runner-turned philanthropist who was building the largest children’s hospital in Africa round the corner. We made sure to mention we’d run one of the hardest marathons in the world a few months prior (!) but there was no disguising that we were at the far amateur end of the visitor spectrum. Undeterred we set out to explore. And before long, I’d solved the long-standing question of just why Kenyan athletes are so good. Forget the theories about fast twitch and slow twitch muscle, the benefits of being born and training at altitude, the virtues of a good diet and hard work or even the motivation that comes from running (literally) away from poverty. No. I believe the reason for such high levels of success is down to the view. Why would you stop running when every twist and turn reveals such stunning scenery? The other great thing about Iten is running into other runners. You won’t get far before a group of lanky Kenyans glides effortlessly past you. And you also won’t go long before someone stops to say hello and chat. Early on I met Charles. He can run 800m in 1 minute 48 seconds. It’s nowhere near Rudisha’s world record of 1:40:91 but it’s fast enough that he has placed his hopes for making a livelihood through running professionally. Until he makes it, he lives in accommodation right next to the running track that the government built for a competition many years ago. They now let athletes who can’t afford rent to stay there for free. It’s a corrugated iron shack with no windows, kitchen or toilet. Charles’s chances of making it big are a way off but he has hope and a few tactics in mind. First, he is swapping from sprints to middle-distance running as a less competitive field. Second, he is looking to get foreign citizenship of a country less blessed with natural running talent. France for example. There at least he could stand out from the crowd and have a chance of pocketing some lucrative winnings. He promised that if I helped him get a passport he’d split his earnings with. It was tempting… Finally his third tactic, if running doesn’t work out; the army. Providing he can pay the bribe to get in (!) he could earn 1.2million Kenya shillings if deployed to Somalia. A small fortune if you survive. 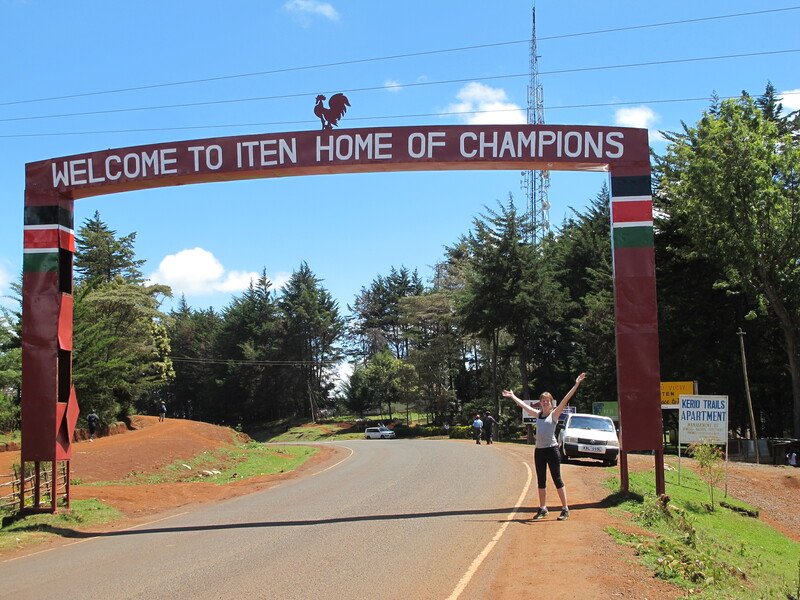 So Iten is home to the wannabes, the up-and-coming but also the arrived. On Tuesday morning all of the above turn out for early morning training at Kamariny Stadium. It’s a dusty, worn-out track but it’s packed to the brim and awash with colour as people race past timing their laps. There amongst the crowd was Kipsang. Now I really don’t know much about running but it wasn’t hard to see that his was a superior, effortless glide. And you can’t help but be a little star struck watching someone who has achieved so much.